In the good news department, I’ve recently found out that I’ve had two papers accepted at upcoming religious studies/theology conferences. I’ll be presenting a paper called “A Theological Aesthetics of Desire: Divine and Human Eros in Pseudo-Dionysius” at the Eastern Regional Meeting of the American Academy of Religion in Syracuse, NY in May. 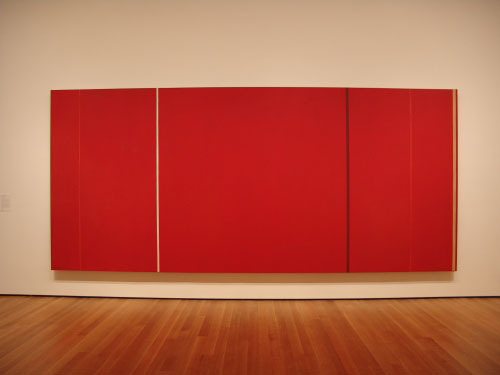 And barring any unforeseen circumstances, in November I’ll be at the main AAR/SBL annual conference in San Francisco to present a paper called “Mystical Embrace: Barnett Newman, Primal Desire and Apophasis” as part of the Explorations of the Religious in Contemporary Art section. Andrea and I are looking forward to both of these journeys south of the border and the opportunities they will provide for visits to IHOP. Hey, I don’t like IHOP but I do like Target! Hey Brett: CONGRATULATIONS on your two appointment to read. I’m not really sure what it all means but, we sure are proud of you……!!!!! Look forward to more information. P.S. I’m surprised you didn’t ask me to proof read it…HaHa! Thanks! Sometime I’ll get you guys a copy of my paper.